Tomás A. Sancho was born in 1962 in Zaragoza, Spain. He has a Master in Civil Engineering from the Politechnic University of Madrid, and a degree in Law and in Business Administration and Management from University Carlos III of Madrid. He has been President of the Ebro Water Confederation and President-founder of 3 State societies related to water (ACUAEBRO, Canal de Navarra (Navarra Channel) and Canal Segarra-Garrigues (Segarra-Garrigues Channel). He is Past President of the World Council of Civil Engineers (WCCE) and is member of the Executive Council of WFEO. 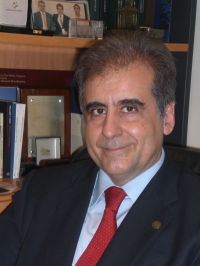 He is also Vice-President of the Spanish Civil Engineers Association and Vice-President of the Spanish Engineering Institute International Commission. He is currently General Manager of FYSEG, Fulcrum y SERS Engineering Group. He is an expert in topics related to infrastructures funding, planning and water management.